MidNite Sleep Aids: Are They Bogus Or Beneficial? You Decide. Are you a shift worker? Do you have problems with jet lag? Do you often wake up in the middle of the night and have trouble getting back to sleep? Then the makers of MidNite sleep aids claim that they have the product to help you solve these nighttime problems. MidNite strongly emphasizes that it is drug-free, uses all natural ingredients, and can be taken at any time during the night as long as you allow yourself at least 3 hours of sleep between the time you take a dose and the time you need to wake up. But how true, exactly, are all of these claims? What are these natural ingredients which allegedly work better than an over the counter or a prescription sleep aid? Here at BestSleepingPills.com, we know which sleep supplements do - and do not - work. Our evaluation of MidNite sleep aids will help you decide for yourself whether or not this product can work for you. There are three different versions of the MidNite sleep aid formula. The first one, their regular formula, contains 1.5 Mg of melatonin. It also contains a 22 microgram blend of lemon balm, chamomile, and lavender. They fail to specify exactly how much each ingredient is in their proprietary blend, so it's hard to say how much you are getting of each one. The ingredients in the MidNite PM and MidNite Menopause formulas contain the exact same ingredients as the original strength version, but with a few additions. Although you would think that the PM formula would somehow be the extra strength or the extended release version of the original, there doesn't seem to be any clear distinction between the purpose or the effectiveness of the two; they only mention the addition of bromelain. Furthermore, they don't bother to explain the science behind the addition of the soy-derived genistein isoflavones in their Menopause formula. Are There Benefits to Taking MidNite? 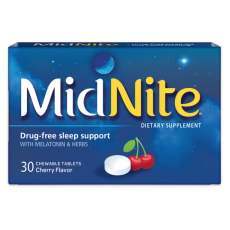 For starters, it's good that the manufacturers of MidNite did not include any diphenhydramine or other unhealthy chemicals which are commonly found in over-the-counter sleep aids. Some studies are starting to show that long-term use of these drugs and similar over the counter medications could accelerate brain aging and leave you vulnerable to age-related brain diseases near the end of your life. The fact that it contains ingredients like melatonin, chamomile and lavender shows a lot of promise. As any homeopathic expert will tell you, these herbs have been used for centuries in order to help people alleviate their sleep problems. The addition of these ingredients certainly helped improve our opinion of MidNite sleep aids. Will MidNite Help You Get Better Sleep? MidNite sounds good at face value, but when you take a deeper look into things, it's probably not the most effective herbal sleep aid out there. For starters, it only has a few of the natural ingredients which most homeopaths agree are effective for sleep problems. This formula has plenty of room to incorporate more, but for whatever reason, the manufacturers of MidNite have chosen to limit the number of ingredients they use. And we aren't very confident that a 22 mcg blend of these three ingredients is a sufficient enough dose to help most people get to sleep. There's another issue with MidNite sleep aid products which may cause more harm to your sleep cycle than good. If you're constantly taking these products in order to get back to sleep when you wake up in the middle of the night, this could train your brain to get used to a biphasic sleep cycle. Most sleep experts agree that this is not the healthiest way for the human body to sleep. More often than not, this can wake you up in the middle of your sleep cycle and interrupt your body's natural detoxification processes. Overtime, if you aren't getting a steady, solid 8 hours of sleep every night, it can cause long-term physical and neurological health problems. Lastly, we're not sure about the addition of bromelain and genistein isoflavones in their PM and Menopause formulas, respectively. Don't get us wrong; bromelain is an excellent and healthful botanical extract best known for its anti-inflammatory properties. Unfortunately, our research did not yield any proof that it was effective for alleviating sleep disturbances. Furthermore, a study published in the journal of Aging and Disease found that genistein isoflavones have the potential to cause amyloid-beta plaques to accumulate in the brain, which is the most common cause of diseases like alzheimer's. This ingredient is also a phytoestrogen, which can increase women's risks of certain types of female cancer. Strangely, the homepage for MidNite does not offer direct online purchases. But they do offer a search tool which will connect you to your nearest MidNite sleep aid retailer. These retailers include popular franchises such as CVS, Target, Walgreens, Walmart, and Bed Bath & Beyond. You may also be able to get MidNite off of online retailers such as Amazon or Ebay - but it is unclear whether or not these are counterfeit products or not. It's also unclear whether the $1 coupon which you can print off the MidNite website will work online or whether or not you have to take it to a store in order to redeem. However, most people may find very little value in the $1 coupon since the product can be found for about $12 or less, depending on where you shop. Based on our research, it does not seem as though the manufacturer offers any sort of money back guarantee if you are dissatisfied with your purchase. We found this to be more than a little bit disappointing. There may be some rave reviews about MidNite sleep aids, but we're a bit concerned about its sparse list of effective ingredients and the fact that it could encourage biphasic sleep. Thankfully, there are plenty of products out there which don't suffer from either of these handicaps. We encourage you to learn all about them on our natural sleep aid reviews page.